Among their many achievements, Mochica (also known as Moche) society is well-known for their innovations in and mastery of ceramics. Celebrated for their figurative vessels—often resembling animals, plants, deities, and even adult activities—Mochica ceramicists produced a variety of exquisite forms whose painted and sculpted surfaces reflect the vibrant life, religion, and culture of the Mochica people. Mochica stirrup spout vessels, in particular, would take on complex and figurative scenes. Named for their resemblance to stirrups, such vessels are identifiable due to their wide body, which connects to an elegant circular hollow handle. Though unsure of exactly what was stored in these vessels (until recently it was believed that their purpose was mainly funerary), it is likely that they contained beverages like corn beer (chicha). Equal parts beautiful and versatile, stirrup spout vessels were also functional: in the high elevation deserts of Peru, the narrow spout would prevent the evaporation of the vessels’ liquid contents. 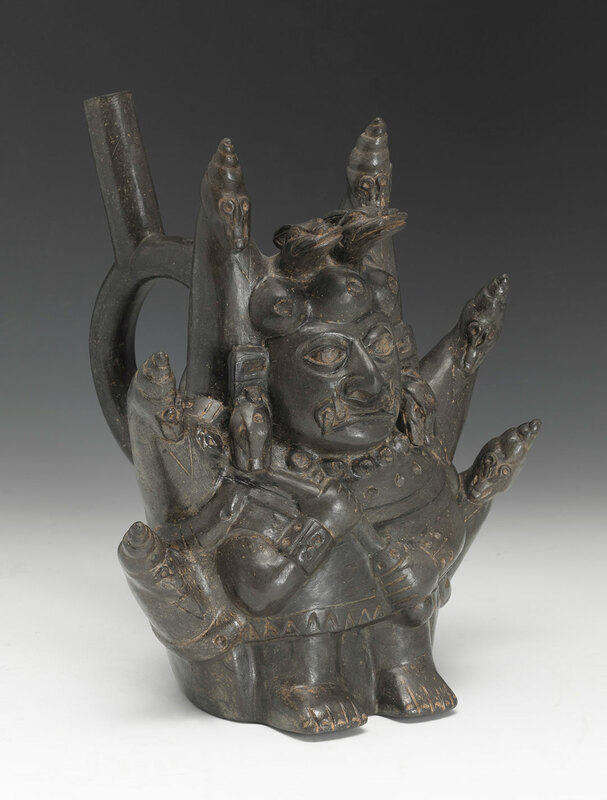 In this Ai-Apec Stirrup Spout Vessel on view in the exhibition Cosmic Beings in Mesoamerican and Andean Art, an anthropomorphic figure stands surrounded by six peaks topped with snail shells, which also share anthropomorphic features. Holding a staff, the stoic figure—Ai-Apec, the chief deity of the Mochica—dons a patterned tunic and pendant earrings in the form of feline heads, as well as a helmet with two more feline figures. Generally, Mochica vessels are slip-painted and bichrome, with red decoration on a white or cream background. However, this Ai-Apec vessel is much darker—a type of ceramic known as blackware; the dark color is achieved through a firing process that removes oxygen from the kiln, causing iron compounds in the clay to turn black. Not only does this piece represent a mythical continuity between the Mochica and later Chavín and Chimú cultures, but it represents an artistic continuity as well—such blackware ceramics were also made by the Chavín and Chimú.